I caught this fish under the Coast Guard station. They eventually saw us and gave us a “random inspection” before encouraging us to leave. If you’ve never been on the open ocean on a small boat intended for use in the lake, then you haven’t lived. My first trip was on a 17-foot Bayliner with high gunwales out of the Port of Brookings-Habor. It was a little rough, but I wasn’t worried. My second trip was on a 14-foot flat-bottomed aluminum duck boat, and I was more than a little worried. Fortunately, before we made it to the end of the bar, the Coast Guard stopped us and told us the bar was closed to small vessels. I was equal parts disappointed and relieved. My friend, Eric Elenfeldt, is a phenomenal boater, and if I were to go on the ocean in a tiny vessel with anyone, I’d want him driving, but still. It was a rough bar that day. We made the best of it, dropped our crab pot, and started fishing. 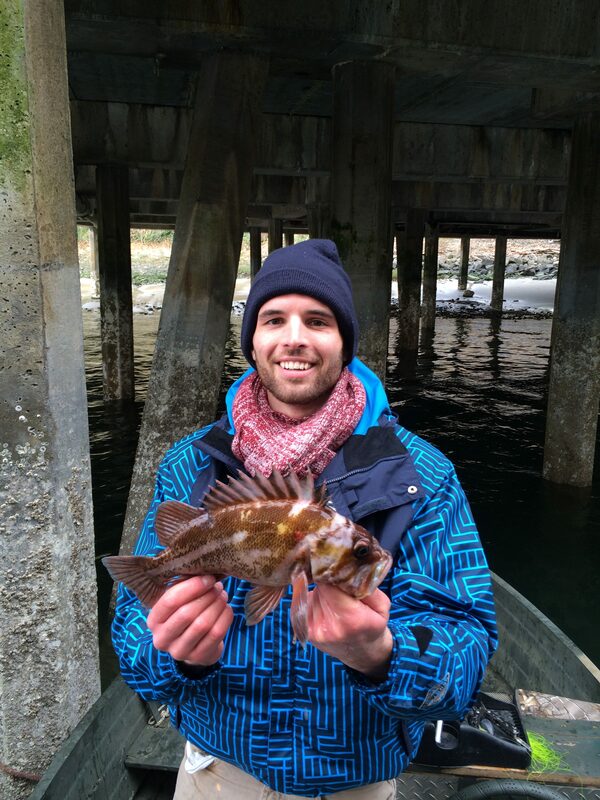 He picked up a Red Irish Lord, his first, and we started catching a few rockfish here and there. Before long, the sheet rain started, and we took cover under the Coast Guard station’s large platform. It was the best decision we made all day. Almost instantly, we caught fish. 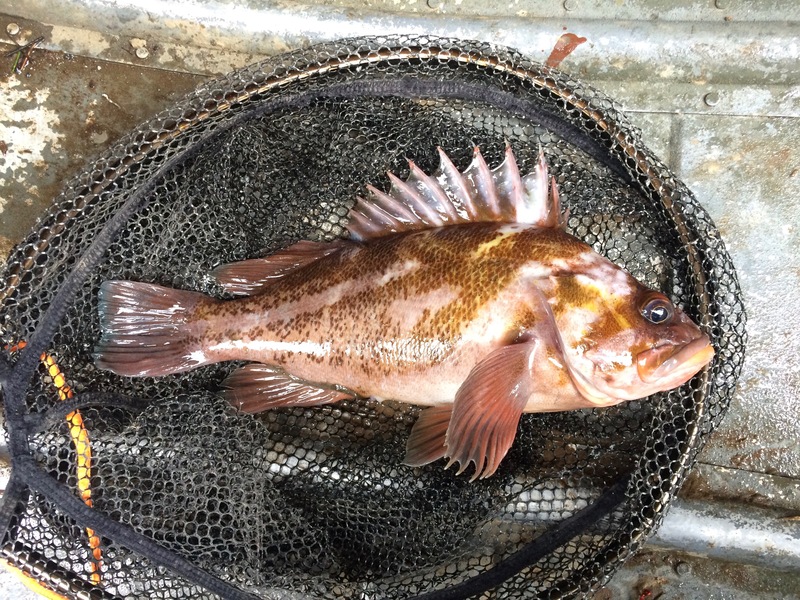 Small Lingcod at first and then my first Copper Rockfish obliged me. Then several more. Smedium Copper Rockfish and small Lingcod were the bulk of the catch here. Eventually, the guys on the platform spotted us and performed a “random inspection” even though Eric’s inspection sticker was clearly visible on the side of the boat. They gently asked us not to fish there because it was a matter of national security, and though I’m pretty sure they can’t do that on a navigable waterway, we moved. It wasn’t long before we saw them fishing from the platform. Huh. The rest of the day was slow as we struggled to find fish, but we’d learned something: the Coast Guard defends its fishing spots as well as they defend the lives of those out on the ocean. Read the next entry in #SpeciesQuest here: Species #74 — Redear Sunfish.